What DIDN'T the Flintstones have? Wilma's uncle Lulu and Betty's aunt Charlie come to town to visit at the same time. Wilma and Betty decide to try and get the two together as they are both single. Upon their arrival however, the pair immediately set to their nagging, complaining and awful ways and are completely disinterested in one another. To get them out of their houses, Fred and Barney start to scheming. To convince Lulu and Charlie that they are, in fact, perfect for one another, Fred concocts a plan to use the "municipal computer" (a room-sized behemoth of course) to prove it once and for all. And that's where things get crazy! 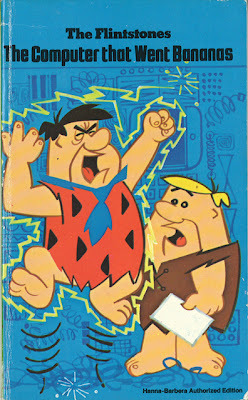 I have no idea if this book still exists anywhere, but trust me, it's worth tracking down at the library or on eBay. It is truly hilarious and bizarre. As reported by Gizmodo earlier today, the Pantman F1 may very well be the best named pants-related product on the market. Like my profile says, "pants" is one of the greatest words in the English language. It is a sad day for world rally fans. Colin McRae, one of my all-time favorite rally drivers and the reason I got interested in WRC in the late 90s, apparently died in a helicopter accident earlier today. I will always remember the amazing combo of McRae/Grist and their thrilling knife's edge race wins or spectacular crashes. It was often maddening being a fan of the duo because you never knew if they were going to finish the rally. One of my favorite memories came a few years after McRae retired, at the X Games of all places. Moments from certain victory in the inaugural rally racing event, McRae rolled the car once, then without hesitating, continued on to the finish (sans front fascia) and came in second place by only 1/2 a second. Consummate professional. Fun to watch, always. He will be missed. Well, the inevitable has come to pass. I have to sell Gertrude. Who is Gertrude you ask? She is a beautiful 1984 Porsche 928 S which belonged to my father and now resides in my garage. I have finally come to the realization that I cannot hang onto her any longer. I lack the time and the funds to take proper care of her. Take a look for yourself. 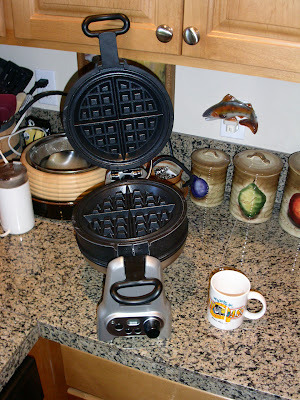 So yesterday I ventured to my mom's place to help her break in her newly acquired Kitchenaid Pro Line Waffle Baker. The first thing I noticed was the ginormousness of the thing. Then I tried to lift it. 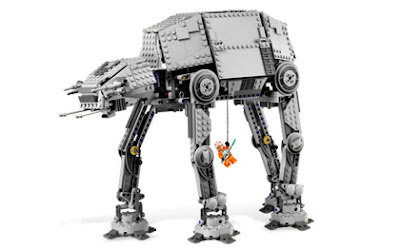 It weighs over 20 pounds...roughly equivalent to 2.5 gallons of milk. The word "overkill" came to mind. How were the waffles you ask? 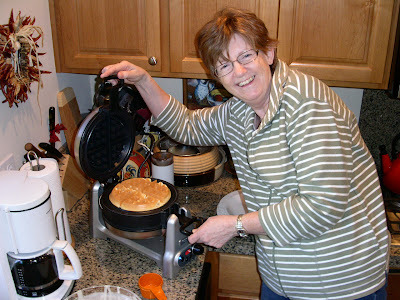 Well just look how happy my mom is with the first waffle. As expected, the waffles came out looking very professional and very delicious. 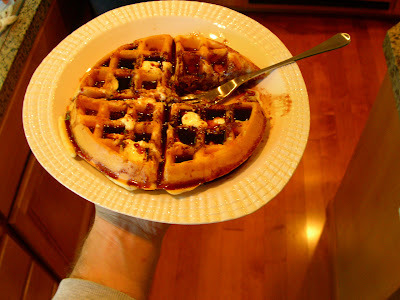 After much syrup and butter, the waffles looked even better. And after one waffle, the couch looked very inviting. You can see the whole experience here. Enjoy! 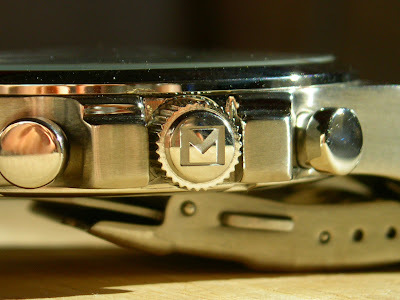 Not only is the watch a classic, clean and timeless design, it also wont break the bank. 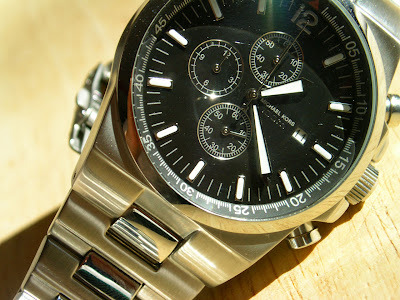 It's a true chronograph with the sweep second hand (seen above in the 12 o'clock position) acting as the stopwatch second hand while the top and middle dials register minutes and hours respectively. 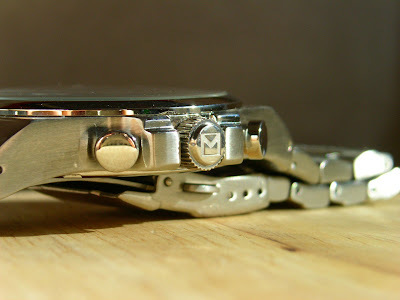 The bottom dial is the second hand for the watch, which has taken some getting used to. All in all, it is a fantastic addition to any man's watch collection, especially those who do not have two grand to spend on a Tag Heuer but want a watch that looks the part. I have actually gotten more compliments on this watch than any other in my (sadly small) collection.